ANDRITZ Feed & Biofuel Technologies is one of the world’s leading suppliers of technologies, systems and services for advanced industrial equipment for the animal feed, aqua feed and pet food industries, and for the biofuel pelleting industry. Their production lines are based on a full program of well-proven process machinery and equipment in combination with inteted IT solutions that ensure easy operation, high plant efficiency, and full process traceability. All ANDRITZ equipment and solutions take account of the demand for reliable processing, cost efficiency, and uniform, high-quality feed and biomass products. When choosing products and solutions from ANDRITZ Feed & Biofuel Technologies, you will have a qualified and experienced partner with the ability to assist you all the way from the start to the finished product. 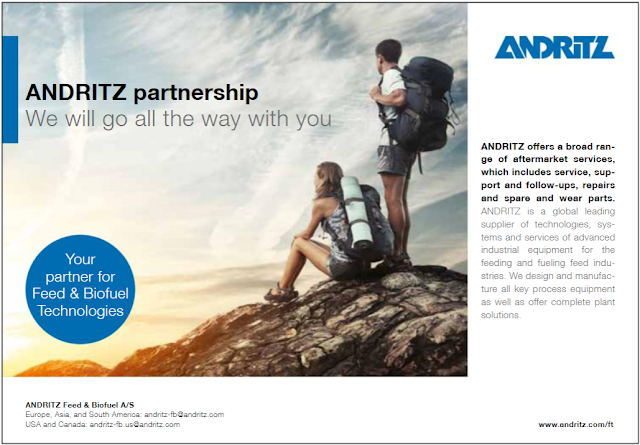 Visit the ANDRITZ website, HERE.